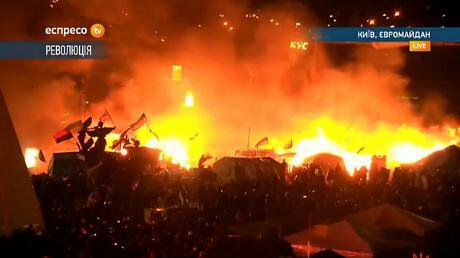 In the media spotlight: a screeenshot of the private station Espresso TV reporting live from Maidan.The central image in world news now is the monument of the legendary founders of Kyiv—three brothers, Kyi, Shchek and Khoryv, and their sister, Lybid—surrounded by protesters defending Maidan Nezalezhnosti (Independence Square) from riot police and tityshki (paid lumpen and petty criminals) used by the power bloc. The minister of interior affairs, the prosecutor-general and the president of Ukraine have called this confrontation, begun early on February 18, a “counter-terrorist” operation aimed at putting an end to “all extremist elements”—that is to say, everyone opposed to the prevailing system of corruption, nepotism, criminality, vulgarity, hypocrisy and violence. When opposition leaders had announced at a popular assembly on February 16 a peaceful march to Verkhovna Rada (Parliament) two days later, to press the parliament to reconsider the national constitution and return to the 2004 version—a parliamentary republic with reduced presidential authority—issuing from the “Orange revolution”, it seemed that the hard process of mutual concessions could start. Protesters vacated administrative buildings and main streets in Kyiv and other cities and it was envisaged that the prosecutor-general’s office would start to release detained activists, according to the law, the following day. The next step could be parliamentary discussion and decision. It was logical—but unacceptable for the regime. Thus, the prosecutor-general hinted that the process of release of prisoners could last several months and a speaker of Parliament indicated that negotiations on possible changes to the constitution and presidential elections would need even longer. The president, Viktor Yanukovych, had met his Russian counterpart, Vladimir Putin, in the margins of the opening ceremony of the winter Olympics in Sochi on February 8 and what followed echoed a theme of the early 20th-century Russian revolutions—provocation. The confrontation on February 18 started with apparently uncontrolled provocations near the parliament building. The riot police turned out to be remarkably well prepared, however, with snipers on the roofs, warlike equipment and a perfect deployment to retake the main square. An MP from the ruling Party of Regions promised a little bit later on Russian TV that Maidan would be cleared within an hour. After hours of violent clashes, with riot police blocking the square from all sides, about 30 were dead and some 800 wounded. Yanukovych issued an appeal which described the protesters as radicals and extremists—a characterisation repeated in the Russian media—and asked opposition leaders to dissociate themselves from those in the square. What the president and his servants did not want to face was the national-popular nature of the protests: after the night of fierce confrontation, uprisings restarted in many other cities and regions, first in the historically more Europhile western part of Ukraine but later also in central and eastern areas. Two weeks ago, a survey by the centre Democratic Initiatives revealed that 87 per cent of the population distrusted the law machinery and especially the police. After the events of recent days, this distrust can only grow, including with regard to the presidential administration and government. On the morning after the night before, on February 19 protesters began arriving in Kyiv—in spite of blocked roads, interrupted railway connections and a transport collapse in the capital itself. Many enterprises and offices were closed, as on the next day too, and the underground didn’t work. Almost all Ukrainians watched events unfold on their TV screens. And the question on everyone’s lips was ‘What next?’—a deepening of confrontation, with new victims and further destruction, or a peaceful solution leading to the changes society demanded? Those demands have escalated: starting with calls for a European political orientation and a return to a parliamentary republic, the public—not only the protesters—now require the resignation of the president and the trial of all those responsible for this tragedy. And here the international community has a major responsibility. This week, the former foreign minister of Ukraine Volodymyr Ohryzko addressed western states in his blog on Ukrainian Pravda: Under these circumstances "the policy of non-interference’"of the EU and the US feels like an obvious betrayal, especially in the light of Russia’s political pressure, economic blackmail and direct involvement of mercenaries in the fight against the Ukrainian people. Your governments adopt all the right declarations. Your politicians make nice statements. But for our authorities and the Kremlin it is an empty sound. They only understand the language of power and real actions. Indeed, both confronting parties in Ukraine understand this. If the regime pursues a bloody victory, it will be a Pyrrhic one. There is a long popular memory in Ukraine of struggles against oppressors: it is not forgotten that whereas the population of the Ukrainian Soviet Socialist Republic constituted only about 17 per cent of the total Soviet number, Ukrainians comprised more than 50 per cent of the inmates of the Gulag. The regime is doomed to failure—the price, however, remains in question.